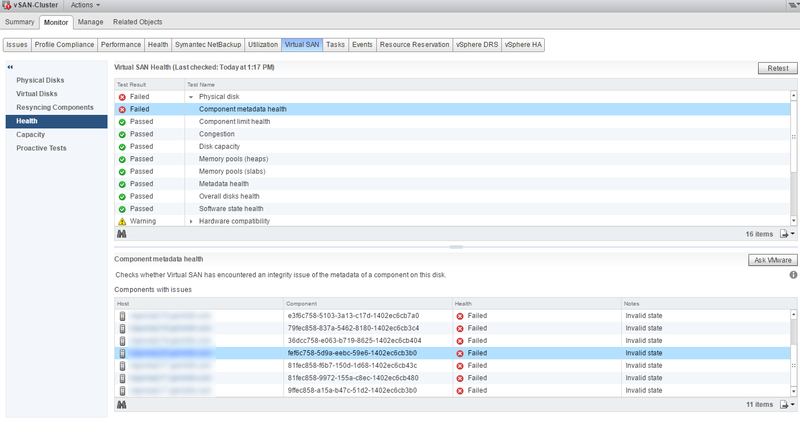 This entry was posted in VMware and tagged All-Flash, VMware, vSAN by mitsujase. Bookmark the permalink. Thank you very much for posting this script! I too have had zero success using the cmmds_find command in RVC to locate the disk associated with an invalid component. And destroying an entire disk group to get rid of it seemed insane. With your script we could ID the problem disk and remove that from the group to clear the invalid component. Glad it helped! We are using de-duplication so have no choice but to destroy the entire diskgroup. BTW this is now fixed in the latest 6.0 patches!